Is this the final hurdle for immunotherapy? It was the winner of the most recent Nobel Prize in Medicine. It has cured cancer patients thought to be untreatable. It’s a $33 billion global market. It’s one of the most sought after offerings for healthcare institutions today. It is immunotherapy, the treatment that uses the immune system to recognize and attack cancer cells and that can be more effective than traditional methods. But if it shows such results, why isn’t every cancer patient getting this seemingly miracle treatment right away? The answer has less to do with the ability of scientists to create better treatments and more to do with just how personalized those treatments are: the fact is that it’s extremely challenging to know how a patient is going to respond to treatment. As a result, many patients suffer severe side effects. That ability to enable doctors to predict how a cancer patient will respond to a given treatment is part of what we plan to tackle at GE Healthcare — what we hope will be the final hurdle for immunotherapies to reach their full potential. It’s why, in partnership with Vanderbilt University Medical Center, one of the most respected institutions in this field worldwide, we are working to create Artificial Intelligence (AI)-powered apps and positron-emission tomography (PET) imaging tracers. In short, they will enable safer and more precise cancer immunotherapies and help doctors avoid potentially damaging, ineffective and costly courses of treatments. Precision medicine, which immunotherapy fits into, is getting a lot of attention right now – why is that? Dr. Balser: Precision health has always been the dream of every patient and physician – treating the right patient with the right drug at the right time in the disease course, without side-effects and with sustained improvement. While improved understanding of cancer cells at a molecular level even now allows us in many cases to choose the “right patient for the right drug at the right time,” based on the molecular signature of the cancer, we are still learning about the complexity of malignancy and how treatment can avoid side effects and deliver sustained remission. As our understanding deepens, our ability to customize safe therapies that deliver sustained cancer remission will improve. We are now able to direct our own immune system to fight certain blood and immune-system cancers, using drugs like checkpoint inhibitors or cellular immunotherapies like CAR-T cells. This success has changed the landscape of therapeutic oncology. What excites you most about immunotherapy? Dr. Balser: Our ability to find answers to even more questions about immunotherapy has the potential to reshape cancer care worldwide. For example, which cancers, including solid-tissue malignancies, have the potential to yield to immunotherapies? How do we combine precision therapy targeted to a cancer-driving DNA mutation with immunotherapy? How do we identify the right patient for immunotherapy, who will benefit from therapy but have the lowest risk for side-effects? While we have made tremendous progress in cancer care over the last 20 years, the potential to effect lasting remissions for some of the most difficult and lethal cancers is incredibly exciting – for all patients and every family impacted by cancer. How is our partnership contributing to tackling the challenge of making immunotherapy more mainstream? 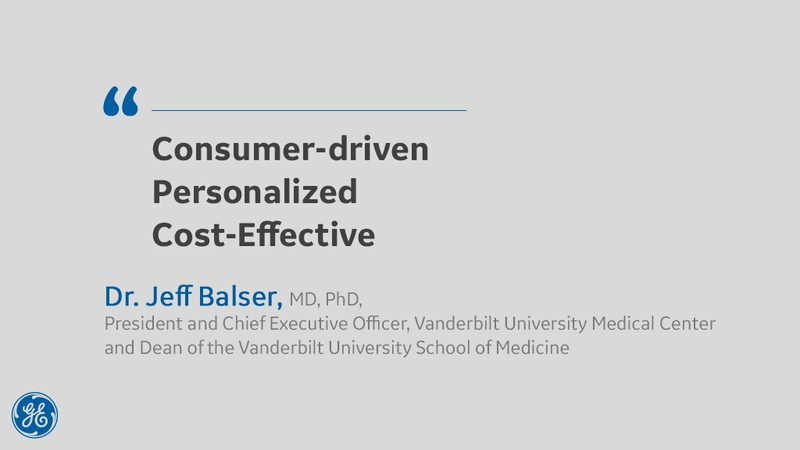 Dr. Balser: Making any new therapeutic advancement available for everyone requires intensive ongoing efforts, beyond the initial introduction of the therapy into the healthcare ecosystem. These efforts range from extensive clinical research to determine those patients most likely to benefit, to product development improvements that make therapies more cost effective and accessible. As such, close partnerships between research institutions and industry are essential to making nearly all therapies, including immunotherapy, readily available. Together, GE Healthcare and Vanderbilt Health can leverage the capabilities of science, technology, and process management to yield true improvements in care delivery. 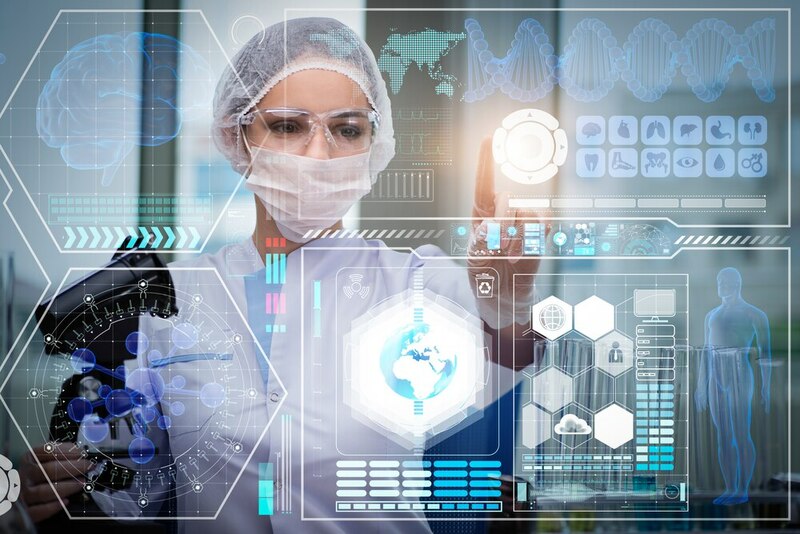 For example, machine learning technologies can be deployed to develop robust predictive analytics, fed by a wide variety of “big data” sources, allowing us to identify the patients most likely to respond to a particular immunotherapy. What is the future of cancer care? Dr. Balser: As we become more adept at treating and preventing cancers, the disease will no longer be a life-ending tragedy for so many patients. Rather, cancer will become a chronic condition that can be effectively managed without limiting a person’s vitality or lifespan. Describe the future of healthcare in 3 words? Kieran Murphy is President and CEO of GE Healthcare.